For information on our Remington Examination process, click here. The art of Frederic Remington defined the American West during his lifetime and played a major role in creating the popular image of the West that persists today. In both painting and sculpture, he portrayed the action and drama of the West. Remington’s subjects, the military, the cowboy, and the American Indian, centered on conflict. In some of his best works, conflict was not only the subject, but also created the aesthetic tension of the artwork. Although closely identified with the American West, Remington actually spent much of his life in the East. Born October 4, 1861, in Canton, New York, Frederic was the only child of Seth Pierre Remington and Clara Bascomb Sackrider Remington. Remington attended the Yale College School of the Fine Arts for three semesters beginning in 1878, and also played football on the Yale team. After his father died, he left school and started working as a reporter. In 1881, he made his first trip west to Montana Territory and subsequently sold his first sketch of cowboys to Harper’s Weekly. In 1883, he bought and worked a sheep ranch in Peabody, Kansas. On October 1, 1884, he married Eva Adele Caten of Gloversville, New York. His ranch and other business ventures in Kansas City, Missouri, being unsuccessful, Remington ended his only western residence and then traveled in the Southwest. By the mid-1890s, Remington became one of the most popular and successful illustrators of the age. His drawings of cavalry troops, cowboys, and Indians filled popular periodicals such as Harper’s Weekly and Collier’s. His illustrational drawings trained him to use line effectively. 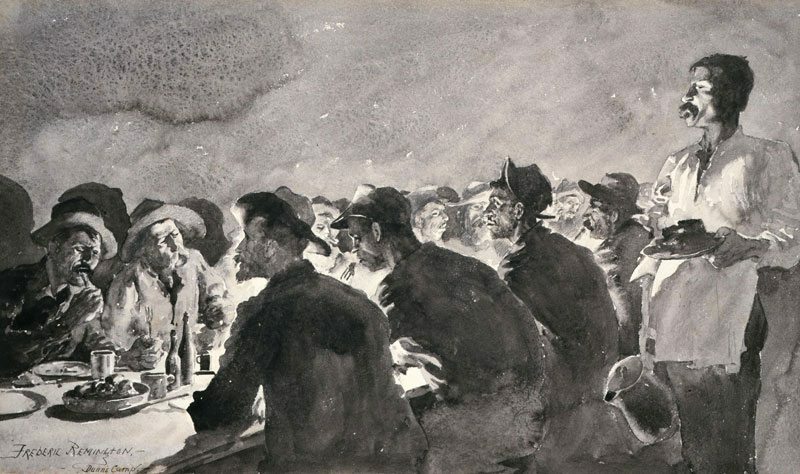 Painting illustrations in black and white, such as The Mess Tent at Night, also guided him in controlling values, the degree of light and darkness. His success as an illustrator earned him the freedom to define his own themes, and he matured as an artist. The Remington Studio reconstruction in the Whitney Western Art Museum. However, always looking to develop his artistic abilities, Remington turned his attention away from illustration, and began concentrating on painting and sculpture. To gain knowledge of his subjects, he began a pattern of annual trips to the West. At his home in New Rochelle, New York, Remington created a western environment in his studio by surrounding himself with collected objects. The Whitney Western Art Museum has a comprehensive reconstruction of his magnificent studio. In his early career as a painter, Remington took several opportunities to paint portraits of westerners at work. In 1889, he accepted a commission from Milton E. Milner to show him and an associate, Judge Kennon, out searching for new cattle range in Montana Territory. Prospecting for Cattle Range is an example of Remington’s early style, featuring realistic details, tight use of line, and clearly articulated shapes. Remington succeeded in both two-dimensional and three-dimensional artworks. His bronze The Broncho Buster represents a human struggle to control nature, and has become a classic symbol of the American West. Stirred by action, Remington designed his sculptures to feature movement—challenging the limits of the medium. Later in his career, Remington experimented with the perception of color. He lightened his palette and placed his colors as they would be affected by light. After 1900, Remington received critical acclaim for his tonal paintings of night scenes. 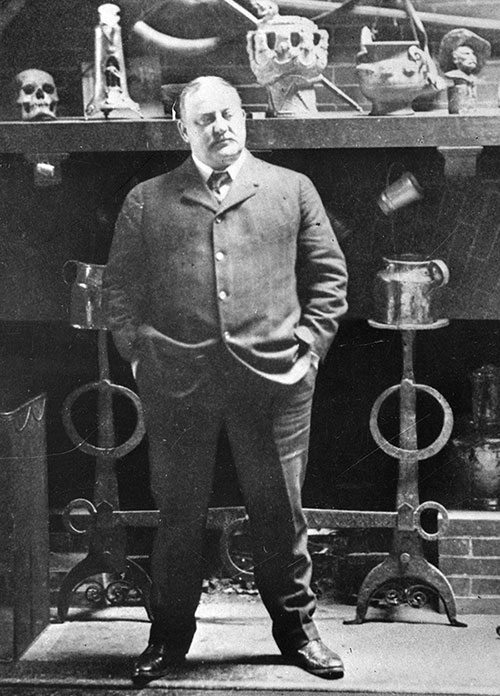 Frederic Remington was 48 years old when he died December 26, 1909, from complications following an appendectomy. During his short life, Remington produced more than 3,000 drawings and paintings, 22 bronze sculptures cast in editions, two novels (one of which was adapted to the stage), and more than 100 magazine articles and stories. Our collection includes many two-dimensional works by Remington as well, including finished oil paintings, studies, sketches, pen and ink drawings, and watercolors. Click here to take a look. See also the online Remington Catalog Raisonné. Anderson, Nancy K., with contributions by William C. Sharpe and Alexander Nemerov, Frederic Remington: The Color of Night. Washington, D.C., Princeton and Oxford: National Gallery of Art and Princeton University Press, 2003. Publication accompanying an exhibition of Remington’s night paintings. Provides a catalogue raisonné of his nocturnes, important essays on the significance of Remington’s accomplishments, and conservators’ notes. Ballinger, James K. Frederic Remington. New York: Harry N. Abrams, Inc., (in association with the National Museum of American Art, Smithsonian Institution), 1989. Thoughtful analysis of Remington’s artistic development, from his work as an illustrator to a fine arts painter/sculptor. Buckland, Roscoe L. Frederic Remington: The Writer. New York: Twayne Publishers, 2000. Study of Remington’s contributions as an author. Contains biographical information, mostly drawn from earlier secondary sources, but useful for an overview of the artist’s life. Dippie, Brian W. The Frederic Remington Art Museum Collection. Ogdensburg, New York: Frederic Remington Art Museum, 2001. Catalogue analyzes the paintings and sculpture of Frederic Remington Art Museum, a collection developed from estate of Remington’s widow. Strong scholarship based on research from museum’s archives. 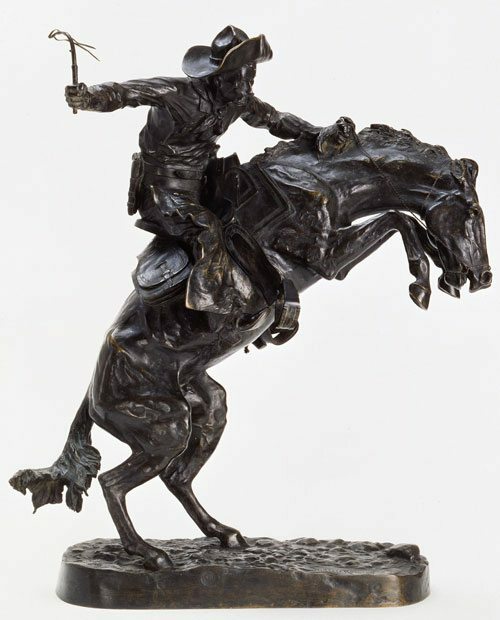 Greenbaum, Michael D. Icons of the West: Frederic Remington’s Sculpture. Ogdensburg, New York: Frederic Remington Art Museum, 1996. Comprehensive, up-to-date study of Remington’s bronzes. Chapter on each sculpture, information on foundry marks, lists of known casts. Extensive photography. Essential for study of his sculpture. Hassrick, Peter H. and Melissa J. Webster. Frederic Remington: A Catalogue Raisonné of Paintings, Watercolors and Drawings. Cody, Wyoming: Buffalo Bill Historical Center (in association with the University of Washington Press), 1996. Two volumes listing all known paintings, watercolors, and finished drawings, with an illustration for each. Catalogue arranged by date with information on materials, size, early publication data, and current location. Accompanying CD-Rom reproduces catalogue and contains additional information on ownership and exhibition history. Essays provide background on Remington and the literature about him. Comprehensive bibliography. Indispensable for studying Remington as a painter. Hassrick, Peter H. The Frederic Remington Studio. Seattle, Washington and London: University of Washington Press (in association with the Buffalo Bill Historical Center), 1994. 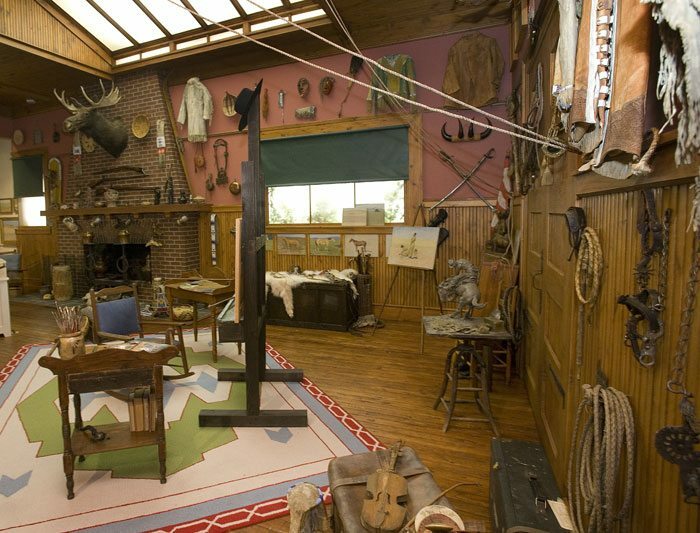 Essay on the artist’s working studio, which has been reconstructed at the Buffalo Bill Historical Center [reinstalled in 2009]. Photographs of paintings and objects from the artist’s personal collection. Hassrick, Peter H. Remington, Russell and the Language of Western Art. Washington, D.C.: Trust for Museum Exhibitions, 2000. Catalogue of loan exhibition bringing together important paintings and sculpture by Frederic Remington and Charles M. Russell. Excellent comparison of the two most important artists of the West. Jussim, Estelle. Frederic Remington, the Camera, and the Old West. Fort Worth, Texas: Amon Carter Museum, 1983. An analysis of the camera’s impact on art-making. Keto, Kelly (Coordinator). Remington, the Years of Critical Acclaim. Santa Fe, New Mexico. The Peters Corporation, 1998. Focuses on the last years of Remington’s career, 1905 – 1909, when the change in the artist’s style brought him critical recognition. Features an important essay on Remington’s tonal aesthetics and night paintings, “The Nocturne Paintings of Frederic Remington” by Melissa Webster. Published by an art gallery, the publication also includes a selection of plates of paintings and sculpture with cataloguing information. McCracken, Harold. Frederic Remington: Artist of the Old West. Philadelphia, Pennsylvania: J.B. Lippincott, Co., 1947. Important early study. Bibliography contains descriptions of print sets useful for print collectors. The Metropolitan Museum of Art. Frederic Remington: “The Truth of Other Days.” New York: Public Media Home Vision, 1990. Video on Remington and his art, with location shots in New York and Wyoming. Neff, Emily Ballew with Wynne H. Phelan. Frederic Remington: The Hogg Brothers Collection of the Museum of Fine Arts, Houston. Princeton University Press in association with the Museum of Fine Arts, Houston, 2000. Catalogue of an important collection of Remington works at the Houston Museum of Fine Arts with insightful commentary on the works and on the patron who collected them. Valuable essay on Remington’s technique by conservator. Nemerov, Alexander. 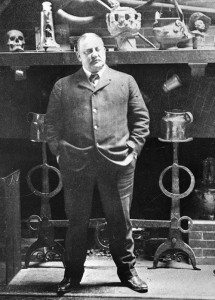 Frederic Remington and Turn-of-the-Century America. New Haven, Connecticut, and London: Yale University Press, 1995. Interprets Remington’s art in the context of his time. Remington, Frederic. The Collected Writings of Frederic Remington. Peggy Samuels and Harold Samuels, eds. Garden City, New Jersey: Doubleday, 1979. Complete compilation of Remington’s published prose including magazine articles, short stories, and novels. Remington, Frederic. Frederic Remington: Selected Writings. Introduction by Peggy and Harold Samuels. Secaucus, New Jersey: Castle, 1981. Forty-three stories by the artist, with his illustrations. Not as comprehensive as The Collected Writings of Frederic Remington, but more likely to be in print. Remington, Frederic. Pony Tracks. Introduction by J. Frank Dobie. Norman and London: University of Oklahoma Press, 1961. Originally published 1895. Remington’s first book, consisting of a collection of reports from the West (written for magazines). This new edition is usually available in paperback. Samuels, Peggy and Harold Samuels. Remington: The Complete Prints. New York: Crown, 1989. Illustrations and publication information on each known print. Samuels, Peggy and Harold Samuels. Frederic Remington: A Biography. Garden City, New Jersey: Doubleday, 1982. Thorough biography of the artist; contains a wealth of anecdotes, quotes, and photographs. A good source of detailed background information. Shapiro, Michael Edward and Peter Hassrick. Frederic Remington: The Masterworks. New York: Harry N. Abrams, Inc., 1988. An excellently written, richly illustrated catalogue. Essays on biography, influences, paintings, sculpture, and writings. Shapiro, Michael. Cast and Recast: The Sculpture of Frederic Remington. Washington, D.C.: National Museum of American Art, Smithsonian Institution, 1981. Groundbreaking study on authenticity. Good explanation of casting methods. Supplanted by Greenbaum’s more recent book, but valuable for in-depth research on bronzes and recasts. Splete, Allen P. and Marilyn D. Splete. Frederic Remington: Selected Letters. New York: Abbeville Press, 1988. The most comprehensive gathering of Remington’s letters to friends, family, and business associates with information on the recipients and circumstances. Cobblestone: The History Magazine for Young People. November 1982. Vol. 3, No. 11. Special issue: “Frederic Remington: His Life and Art.” Children’s magazine with issue devoted to Remington. Contains articles on aspects of Remington’s art as well as activities and games. Giesecke, Ernestine. 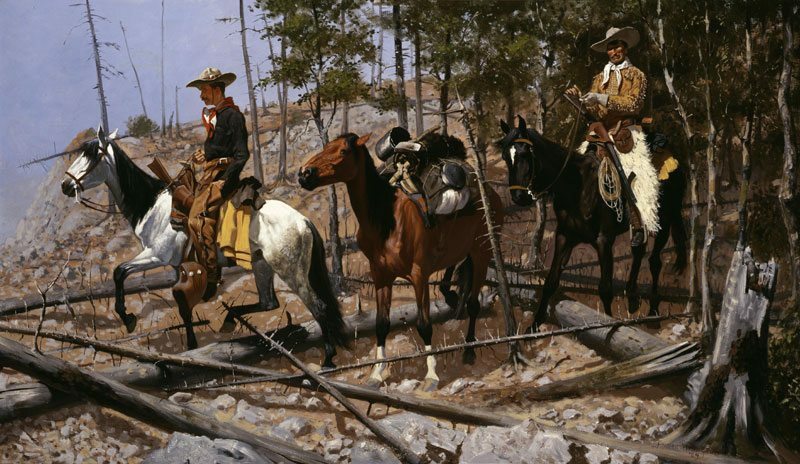 The Life and Work of Frederic Remington. Heinemann Library, 2000. Includes a biography, timeline, photographs, and drawings and paintings by the artist. Van Steenwyk, Elizabeth. Frederic Remington. New York, Chicago: Franklin Watts, 1994. Biography for children. Some photographs of art. Many of the publications in this bibliography that are in print may be purchased online from the Museum Store of the Buffalo Bill Center of the West, or you may order by telephone at 800-533-3838. You can also consult your local library. Books not in the holdings of your local library can often be borrowed through inter-library loan. Prepared by the Whitney Gallery of Western Art, Buffalo Bill [Center of the West]. Revised May 20, 2003.